If you are having trouble sleeping, Over-the-counter sleep aids might help on a temporary basis, however, lifestyle changes are usually the best approach for beating chronic insomnia. 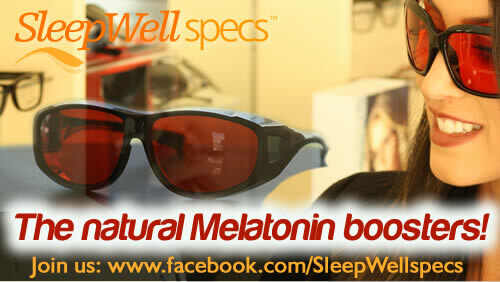 Try SleepWell specs, our best-selling natural sleep aid. Melatonin is a hormone produced by the pineal gland in the brain. It is essential for the human body because it manages the body�s sleep cycles. It is responsible for the relaxing drowsiness we feel as we ease into peaceful sleep. Melatonin is known chemically as N-acetyl-5-methoxytryptamine and is a naturally occurring compound found in animals, plants, and microbes. In animals, circulating levels of the hormone melatonin vary in a daily cycle called circadian rhythms. Sleep Well specs work by filtering the specific wavelengths of light that are responsible for shutting down melatonin production in the brain. Recent discoveries have demonstrated that if light contains only wavelengths greater than 530nm, such light will not suppress melatonin production in bright-light conditions. Research has shown that wearing SleepWell specs leading up to bedtime may support the natural production of melatonin in the body which could dramatically improve your sleep.